What to know: Fun, upbeat songs for your favorite princess. "These are fun songs." "I like princesses a lot." "I know some of the songs, but not like on the CD." "I like to dance to the songs and I took my princess dolls and let them jump on the bed too!" "I'd like to listen to the Jumping On The Bed song right now." Cute rock n' roll take on music for your favorite princess. Princess theme, but music isn't too girly, appealing to a wide range of pre-school aged girls. Little girls love anything princess, so the title and pink cover are great. The content empowers little princesses. Cute. Some piggyback songs that will be familiar to kids, but with new words about princesses. Gets kids up and moving by interacting with songs like "Princess Pokey" and "Five Little Princesses." Along with the familiar melodies are original entertaining songs. 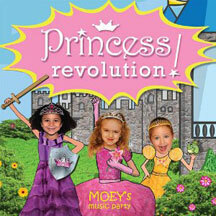 Moey's Music Party, the award-winning children's band, encourages tiara-rific girls everywhere to revel in their brainpower, independence, joy and style. Contains 15 rocking original songs that promote confidence and self-expression while tackling subjects like sharing, body image, keeping promises, and standing up to bullies. Princess Revolution! includes modern musical retellings of classic fairy tales such as "Sleeping Beauty," "The Princess and the Pea," and "Snow White."